Do you ever feel that your brain is not working anymore? Do you feel emptiness at some point in your day? Do you want to get over the feeling of exhaustion and fatigue? If yes then you need to wake up your brain. Now you may ask that What are the best ways to wake up your brain? Answer is Simple : Taking a nap not only improves brain activation but also improves creativity, memory, sense of humor and alertness. What are the benefits of taking a nap? Let me answer you with 10 proven ways to optimize your brain while napping. Are you feeling physically or mentally exhausted? If yes then you should sleep after every two or three hours activity. You an even sleep for two hours after working 9-10 hours. If you take a nap about 10-15 minutes after every three or four hours, it will greatly help you to boost your brain activity. It helps you to stay alert for atleast next 3 to 4 hours. If you are one of those who can take nap than you are the lucky one. Nap not only help brain but body also. It improves blood pressure, avoid fatigue, improve mood, strengthen immune system and increase motivation. Keep the room temperature comfortable, look for quite bed, off all lights and sleep for 10-15 minutes to restore energy levels. Brain only rest when you sleep but only if you sleep atleast 25 minutes. Always try to sleep at-least 10-15 minutes. Are you suffering from memory loss or you feel that you forget things quickly? Napping helps you here also. If you want to memorize something than take a deep sleep. This is well known and recommended by all that napping helps you to reduce stress. I myself always nap when I feel stressed. It`s a good habit to keep your mind and body fresh. DO you know that your brain know how to prioritize things even when you sleep. It helps you to record things. As I have said earlier that napping improves your mood and memory which results a good performance. Napping also improves your emotional levels. After reading a text 6 to 7 minutes nap helps your brain to improve function. 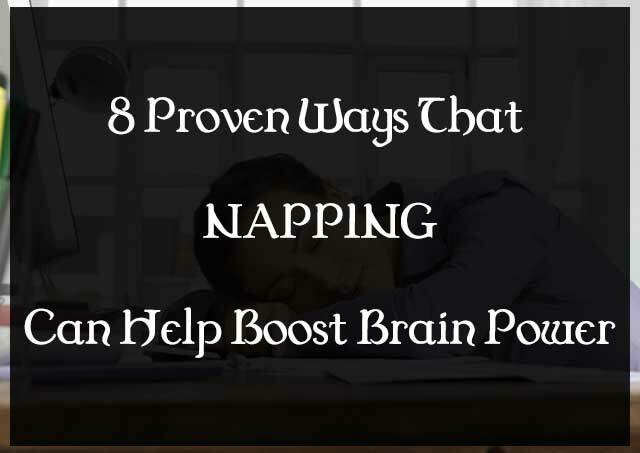 Now you see that these are the 8 proven ways of napping to help boost your brain power. Since the childhood we know that brain is behind everything. So it is always necessary that we should keep our brain healthy. If you have any question or health issues, feel free to ask via comments.